April showers will bring some Duchess of Cambridge-chosen flowers. 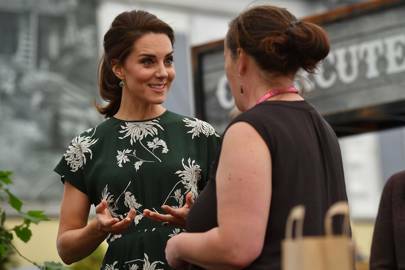 Back in January, Kensington Palace announced that the Duchess would design a garden for the 2019 Chelsea Flower Show in collaboration with the Royal Horticultural Society and landscape architects Andrée Davies and Adam White. The exhibit aims to show the impact nature has on physical and mental health – two of Duchess’s signature causes. It’s also not the first time a royal has lent a green thumb to the show. In 2002, Prince Charles co-designed a garden dedicated to the late queen mother. Now, the Palace has released detailed plans for Duchess’s “Back to Nature Garden.” It’s supposed to mimic a magical woodland of sorts and includes a tree house, waterfall, bubbling stream, a “rustic den,” and a campfire. There’s also a cocoon chair hanging from a tree branch. “The garden is inspired by elements of the duchess’s childhood and by more recent memories with HRH’s own children,” read a statement. Back in December, the Cambridges showed a glimpse of the bucolic family experience Kensington Palace spoke of. Their holiday card featured the Duke and Duchess of Cambridge and their three children immersed in country life at Anmer Hall, the royals’ Norfolk estate.